You are here: Home / Jyotish Gemstones and Talismans / Natural Untreated Peridot set in stering silver hallmarked wreath leaf designer ring. Lovely colour on this Peridot-The superior alternative for Emerald for harnessing the best of Mercury energies. Natural Untreated Peridot set in stering silver hallmarked wreath leaf designer ring. Lovely colour on this Peridot-The superior alternative for Emerald for harnessing the best of Mercury energies. Comments Superior Precious Alternate Natural gemstones act fast as compare to a treated and flawed gemstone. Like an Untreated Natural Peridot Gives 100% better results than compared to a low priced and treated Emerald. This amazing lustrous Peridot set in a sterling silver wreath leaf design makes it more wonderful. The fact that is less known is that Peridot is one of the Superior Alternate precious Gemstone which works very very fast as compared to other Alternate gemstones and gives better than the best results to the wearer leaving no disappointments. 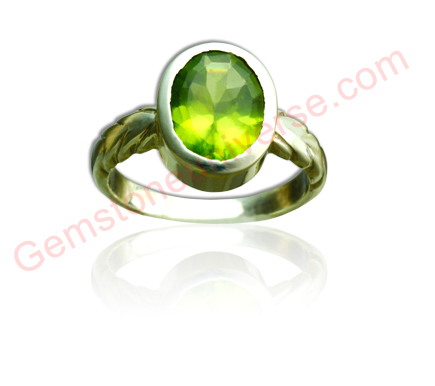 Peridot helps in better communication, wealth and prosperity in life. These Pakistan Peridot is very rare in the market.